Sometimes, (okay, often)… I get these grand ideas. An idea of something we’re going to do, and how it will be so lovely and make everyone feel all warm and fuzzy. Take my make-shift toddler montessori shelf, for example. It worked great. For a couple months. Until the younger one could reach up and pull everything off. Talk about a lack of foresight. There’s something about the anticipation. The set-aside time and space to look at the Giver of all good gifts. To remember that He became the greatest Gift we’ve ever known. “The heart that makes time and space for Him to come will be a glorious place,” writes Ann Voskamp in my favorite Advent devotional. Yes. This is what I’m going for! Choosing to make time and space for Him in my heart. And this is something I want my kids to see in their parents and experience for themselves. Since Addie is almost 3, she can anticipate and understand a little more this year, and I wanted to do something during Advent. Something to plant seeds in her little heart and mind – seeds that God loves her and came as a baby to save the world. Seeds of hope and wonder. Knowing how my grand plans usually turn out, I thought best to keep this simple. The plan: make a calendar, read a story each night, and hang one ornament on the tree after the story. Simple right? How fun and cute and memorable this will be! So, on December 1 before bedtime, I grabbed the Jesus Storybook Bible and tried to make story time by the Christmas tree sound exciting and special. I put on my best manipulative-teacher voice. I turned off all the lights except the tree lights. Then, my angelic children ran over to us and started snuggling on blankets by the tree… Oh wait, no. They ran over to the one light switch they can both reach and started fighting & yelling about the lights on or off. Eventually I intervened and told them to stop and come sit down. Then they both sat right by the tree and started touching ornaments which they’re not supposed to do. The 3 year old was saying, “mom I’m not touching it,” her finger a millimeter away from the tree. (Where do kids learn that game?) The 18 month old didn’t pick up on the nuance so she was just batting at the ornaments. Just. So. Tempting. I put Emma on my lap and told Addie to go sit on the other side of Ben so she wouldn’t be tempted to touch the tree. Tears. Ben starts reading. And for the duration of the creation story, Addie half listens/ half sings Frozen songs to herself under her breath, and Emma just climbs all over trying to grab the Jesus Bible out of Ben’s lap, or perhaps, rip out the pages. Let me know if you need any other parenting advice. 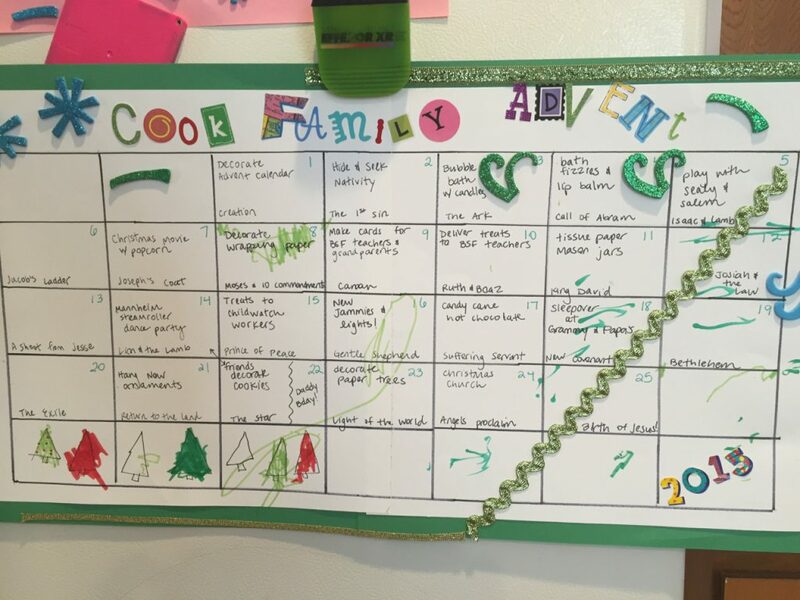 I had to share that story before I tell you what we aim to do at Advent with our littles…. lest there be any appearance of angelic toddlerhood perfection in the pictures and descriptions I share. Now you know, that is most certainly not the case. You can check out the really simple heart-preparing-Christmas-ancitipating Toddler Advent Activity we do over here. Just know it’s a win-some-lose-some kinda thing.